Synthetic marijuana is very different from tetrahydrocannabinol (THC). It’s called K2, synthetic marijuana, and it has caused a cluster of deaths in Chicago. The Chicago Tribune reported three arrests over Easter weekend after large amounts of K2 being sold at a convenience store were discovered to be contaminated with a toxic compound used as rat poison. Between March 10 and April 2, 56 people have been hospitalized in Illinois, all related to K2, the Tribune reported. Two have died. Contrary to what many think, synthetic marijuana is not one drug, and it is very different from tetrahydrocannabinol (aka THC, the main compound in natural marijuana). 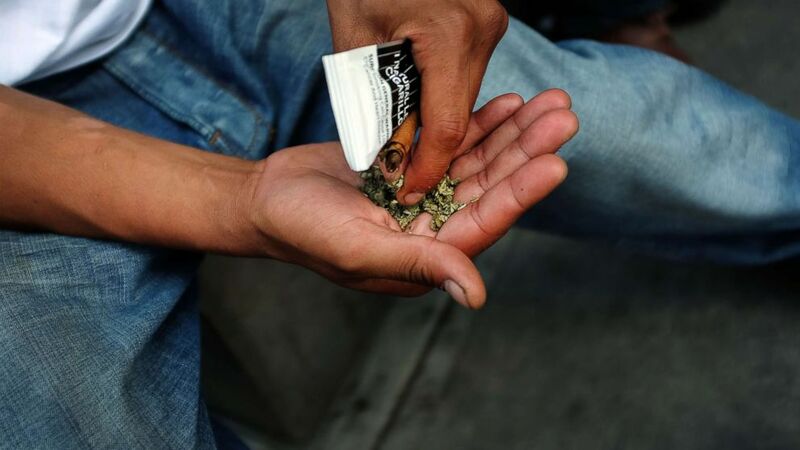 Synthetic marijuana is a “designer drug,” a chemical engineered to create the same effects as an illegal drug, but one that is different enough to avoid drug laws. Synthetic cannabinoids (substances mimicking marijuana) work on the same brain receptors as THC, but can bind to the receptor up to 100 times more tightly than THC. Most were actually developed for research purposes so that scientists could better understand the role of THC receptors in the brain. Unlike marijuana, they have no reported potential for medical use. Eighty-four new synthetic cannabinoids were identified by the National Forensic Laboratory Information System in 2015 alone (for comparison, there were only two in 2009). These chemicals, all vastly different from each other, do not cause identical responses in the brain. People use synthetic cannabinoids for many reasons: easy access, lower cost or the promise of a more intense high than they get with marijuana. Many hope that use of synthetic marijuana will avoid a positive urine drug test since many of the chemicals used to make the drugs are not known to the DEA. In fact, the makers of synthetic marijuana are constantly tweaking the structures of their chemicals to avoid being recognized by the government as an illegal substance and to prevent scientists from developing a drug test for their compound. They are labeled as “natural” compounds based on the plants inside -- even though the active ingredient is a factory-made chemical. Because they have never earned approval from the Food and Drug Administration (FDA), cannabinoids are sold as “herbal products,” “incense,” or “potpourri” to disguise their real use. Most packages are marked with “not for human consumption” -- not because the makers don’t want human to use them, but so that the company cannot be held at fault for problems associated with smoking or eating the drug. 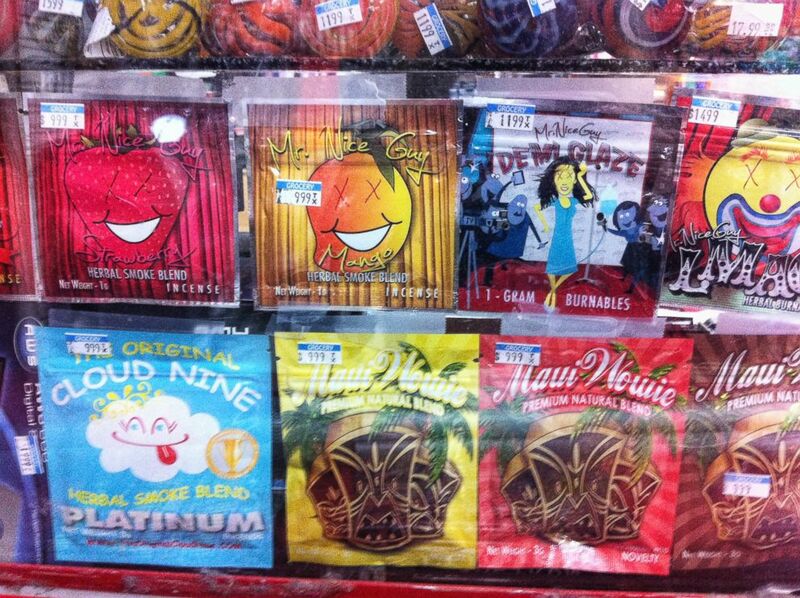 (Susannah Bryan/Sun Sentinel via Getty Images, FILE) Synthetic marijuana, sold in colorful packages with names like Cloud Nine, Maui Wowie and Mr. Nice Guy, sits behind the glass counter at a Kwik Stop in Hollywood, Fla. So, are these substances actually legal? Based on major concerns about the danger of these products, the DEA and local agencies are attempting to keep up with drugmakers to ban every known synthetic marijuana substance, but it’s tough to stay on top of all the compounds. As of 2017, 26 cannabinoids were listed as Schedule 1 controlled substances (the most severely restricted substances), though there are likely hundreds more being sold. What are the effects of synthetic pot on the body? The effects of these drugs are highly unpredictable, as the actual chemical in the package is widely different and may even change from batch to batch. Many buyers experience different effects than intended. First and foremost, these are “psychoactive” substances, which cause an altered mental perception of the world. This high can be associated with irritability, confusion, sleepiness, dizziness and inability to concentrate. At worst, they cause hallucinations (fives times more often than THC), suicidal thoughts and violent behavior. They are also far more likely than marijuana to cause other symptoms like vomiting and muscle breakdown. They can lead to heart problems such as fast heart rate, high blood pressure and even heart attacks. There have been reports of rapid and complete kidney failure related to specific strains of synthetic marijuana. In 2018 so far (through March), Poison Control Centers have received 462 calls concerning symptoms related to these drugs. In 2015, there were 7,762 total calls, the highest year on record. Of the people who call poison control or come to the emergency department for problems related to synthetic cannabinoids each year, approximately 1 in 100 die from these events. Unlike marijuana, synthetic cannabinoids are addictive and regular users report feeling intense withdrawal symptoms when they stop using. 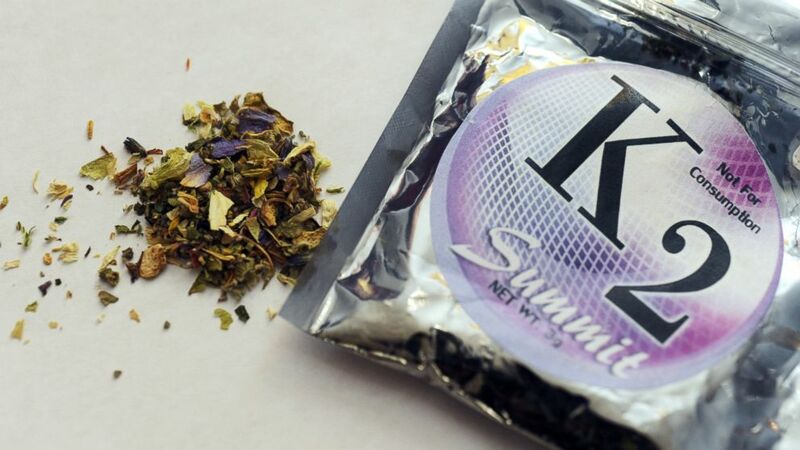 (AP, FILE) A package of K2, a concoction of dried herbs sprayed with chemicals, also known as synthetic marijuana. Just as synthetic cannabinoids are designed to mimic THC, cathinones are designed to mimic the effects of cocaine or methamphetamines. Their effects are just as unpredictable and dangerous. When sold by themselves, they are sold as “bath salts” or “plant food” in order to use the label “not for human consumption.” This class of medications most commonly cause confusion, agitation, aggressive and self-harming behavior. They can also lead to fast heart rate, high blood pressure, muscle breakdown, kidney failure and death. What about the Chicago cases? The contaminating substance in the recently reported cluster of illnesses is brodifacoum. This is the first time that this substance has been reported in synthetic marijuana, but it has previously been reported to be mixed with other drugs of abuse to make their effects last longer. Brodifacoum is a rat poison. It is made from the more commonly known rat poison, Coumadin (or warfarin), whose name you may recognize, since, in small doses, it’s used as a medically prescribed blood thinner. Warfarin and brodifacoum interfere with the body’s natural clotting factors and can cause life-threatening bleeding. Brodifacoum is known as a “superwarfarin,” which means that its effects on the body last a long time and are very difficult to reverse. Bleeding can occur from any part of the body: Several of the recent cases reported bleeding from the eyes and ears, and deaths occurred due to unstoppable internal bleeding. (Spencer Platt/Getty Images, FILE) A man prepares to smoke K2 or "Spice", a synthetic marijuana drug, in East Harlem, Aug. 5, 2015 in New York City. Though they are sold as safe, legal alternatives to marijuana (and a way to avoid getting caught using drugs), synthetic cannabinoids are a different class of chemicals completely. They are unpredictable and highly dangerous on their own -- and can be contaminated with even more toxic and unreported chemicals, making this a hazardous trend that will likely be marked with more reports of deadly events in the future. In addition, know that there is no standardization in the labels or packets, no guarantee what is inside and no idea, if you take a synthetic cannabinoid, what will happen to you. If you or someone you know is having health effects that may be related to synthetic marijuana, seek medical attention. More information can be found at the websites of the CDC and the National Institutes of Health. Dr. Kell Arps is a medical resident working in the ABC News Medical Unit.